Flooding and associated sediment transport in dryland receive little recognition as environmental problems, due to the relatively infrequent occurrence of runoff events and lack of observations. The lack of good quality rainfall and discharge data presents a particular problem for hydrological analysis in dryland catchments. By the exception of a few well-equipped experimental catchments, direct measurements of runoff hydrographs and associated sediment transport in dryland catchments remain very rare. 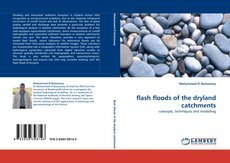 This book, therefore, provides a new approach to model flash floods, where indicators for ephemeral floods can be estimated from time-series analyses of satellite images. These indicators are incorporated into a Geographic Information System (GIS), along with hydrological parameters extracted from digital elevation models to simulate spatially distributed unit hydrographs and transmission losses. The book is also written for geographers, geomorphologists, hydrogeologists and anyone else who may consider working with the flash flood of dryland.